Polygon, a closed, flat shape, with three or more straight sides and angles. 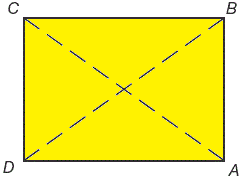 Angle is the space between two adjacent sides of the polygon. Angles are measured in degrees. Vertex is the common endpoint of two adjacent sides of the polygon. 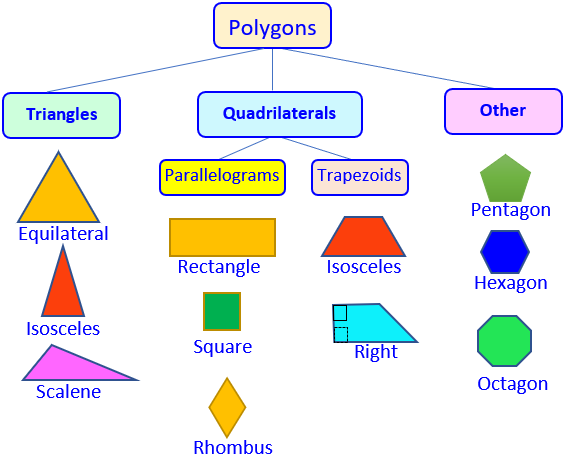 Regular Polygon is a polygon that is equilateral (all sides of equal length) and equiangular (all angles of equal measure). Vertex (plural vertices): the point where two sides meet. Interior Angle: is an angle inside the polygon, formed by two adjacent sides. A diagonal is a line segment that links two non-adjacent vertices of a polygon. Equilateral: Having all sides equal. Isosceles: Having two equal sides. Scalene: Having all sides of different lengths. Perimeter. It is the distance around a figure. Add all sides. Keywords: fencing, framing, edge, border. 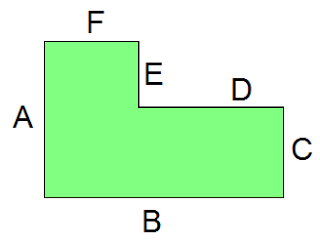 To find the perimeter, just add up the length of all the sides. Area. It is the surface space inside a figure. Keywords: Cover, Painting, putting grass, putting tiles, Square units.